An international team using ALMA, along with ESO’s Very Large Telescope and other telescopes, has discovered the true nature of a rare object in the distant Universe called a Lyman-alpha Blob. Up to now astronomers did not understand what made these huge clouds of gas shine so brightly, but ALMA has now seen two galaxies at the heart of one of these objects and they are undergoing a frenzy of star formation that is lighting up their surroundings. These large galaxies are in turn at the centre of a swarm of smaller ones in what appears to be an early phase in the formation of a massive cluster of galaxies. 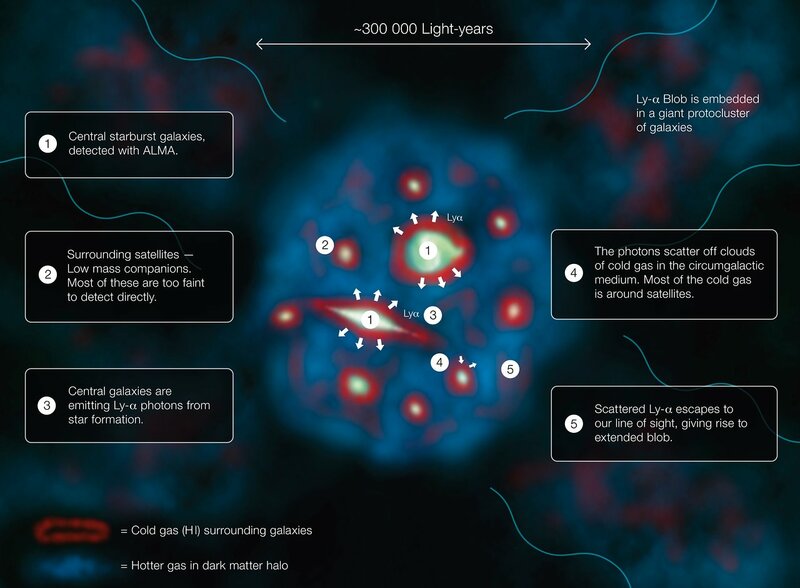 The two ALMA sources are expected to evolve into a single giant elliptical galaxy. 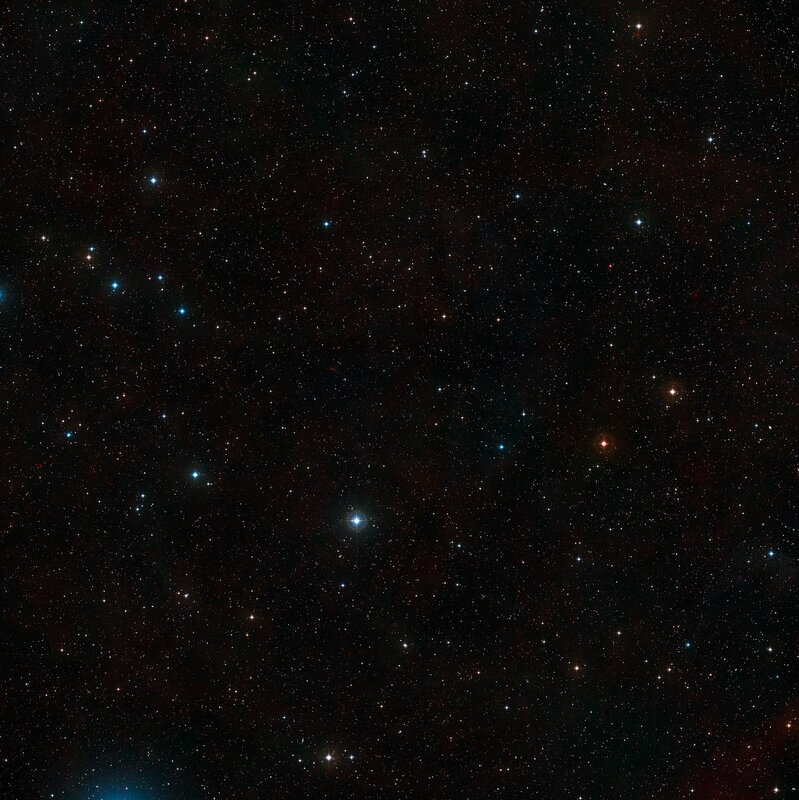 Lyman-alpha Blobs (LABs) are gigantic clouds of hydrogen gas that can span hundreds of thousands of light-years and are found at very large cosmic distances. The name reflects the characteristic wavelength of ultraviolet light that they emit, known as Lyman-alpha radiation . Since their discovery, the processes that give rise to LABs have been an astronomical puzzle. But new observations with ALMA may now have now cleared up the mystery. A team of astronomers, led by Jim Geach, from the Centre for Astrophysics Research of the University of Hertfordshire, UK, has now used the Atacama Large Millimeter/Submillimeter Array’s (ALMA) unparallelled ability to observe light from cool dust clouds in distant galaxies to peer deeply into LAB-1. This allowed them to pinpoint and resolve several sources of submillimetre emission . They then combined the ALMA images with observations from the Multi Unit Spectroscopic Explorer (MUSE) instrument mounted on ESO’s Very Large Telescope (VLT), which map the Lyman-alpha light. 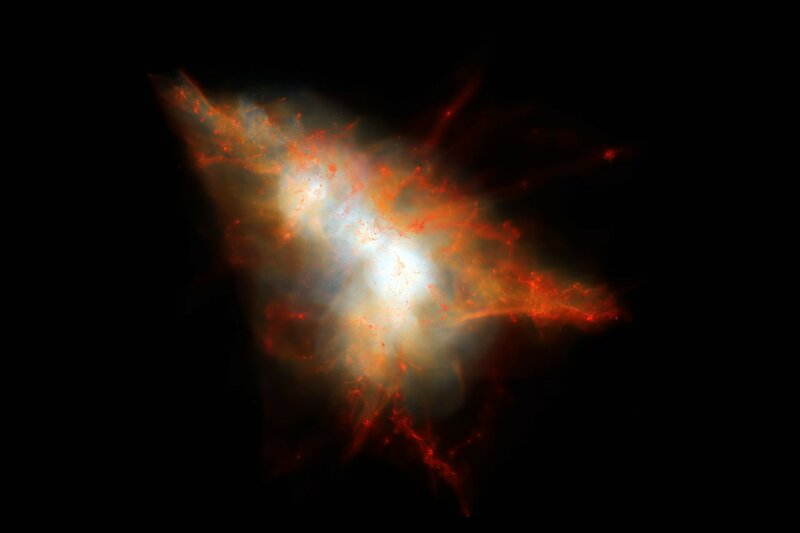 This showed that the ALMA sources are located in the very heart of the Lyman-alpha Blob, where they are forming stars at a rate over 100 times that of the Milky Way. 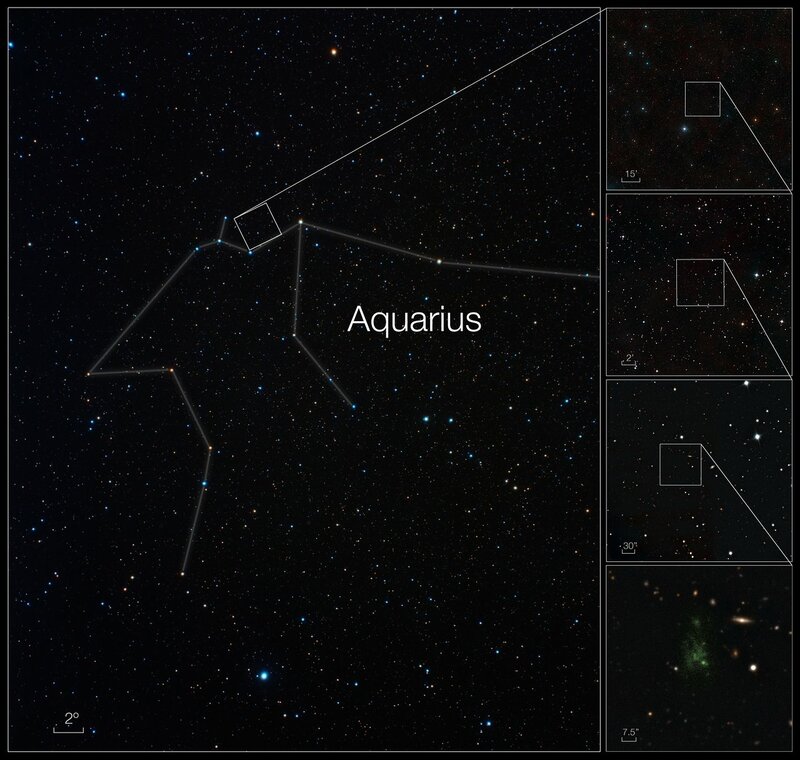 Deep imaging with the NASA/ESA Hubble Space Telescope and spectroscopy at the W. M. Keck Observatory  showed in addition that the ALMA sources are surrounded by numerous faint companion galaxies that could be bombarding the central ALMA sources with material, helping to drive their high star formation rates. The team then turned to a sophisticated simulation of galaxy formation to demonstrate that the giant glowing cloud of Lyman-alpha emission can be explained if ultraviolet light produced by star formation in the ALMA sources scatters off the surrounding hydrogen gas. This would give rise to the Lyman-alpha Blob we see. The negatively charged electrons that orbit the positively charged nucleus in an atom have quantised energy levels. That is, they can only exist in specific energy states, and they can only transition between them by gaining or losing precise amounts of energy. Lyman-alpha radiation is produced when electrons in hydrogen atoms drop from the second-lowest to the lowest energy level. The precise amount of energy lost is released as light with a particular wavelength, in the ultraviolet part of the spectrum, which astronomers can detect with space telescopes or on Earth in the case of redshifted objects. 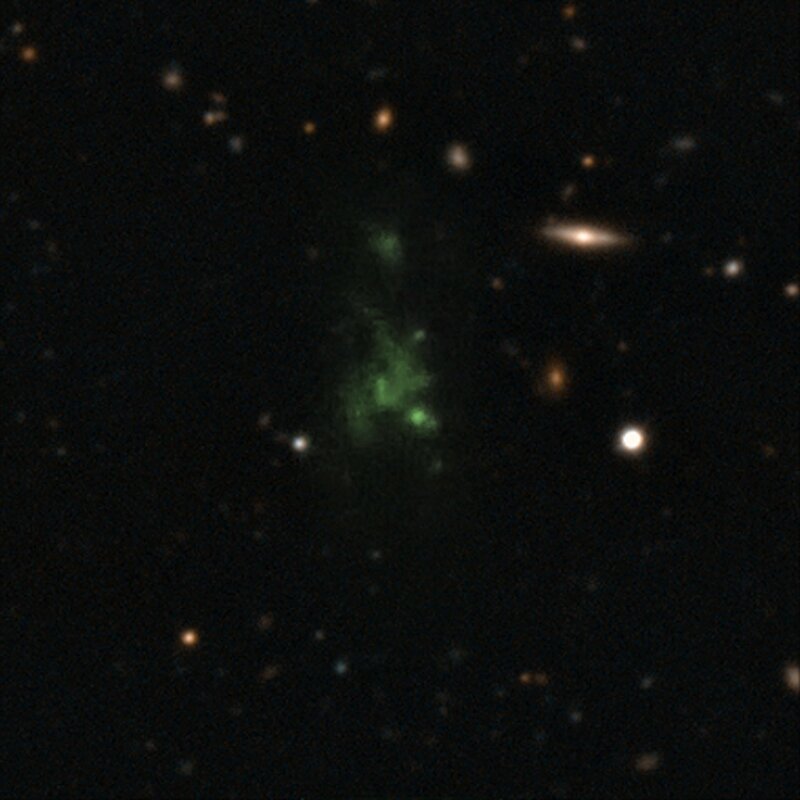 For LAB-1, at redshift of z~3, the Lyman-alpha light is seen as visible light. Resolution is the ability to see that objects are separated. At low resolution, several bright sources at a distance would seem like a single glowing spot, and only at closer quarters would each source be distinguishable. ALMA’s high resolution has resolved what previously appeared to be a single blob into two separate sources. The instruments used were the Space Telescope Imaging Spectograph (STIS) on the NASA/ESA Hubble Space Telescope and the Multi-Object Spectrometer For Infra-Red Exploration (MOSFIRE) mounted on the Keck 1 telescope on Hawaii. This research was presented in a paper entitled “ALMA observations of Lyman-α Blob 1: Halo sub-structure illuminated from within” by J. Geach et al., to appear in the Astrophysical Journal. The team is composed of J. E. Geach (Centre for Astrophysics Research, University of Hertfordshire, Hatfield, UK), D. Narayanan (Department of Physics and Astronomy, Haverford College, Haverford PA, USA; Department of Astronomy, University of Florida, Gainesville FL, USA), Y. Matsuda (National Astronomical Observatory of Japan, Mitaka, Tokyo, Japan; The Graduate University for Advanced Studies, Mitaka, Tokyo, Japan), M. Hayes (Stockholm University, Department of Astronomy and Oskar Klein Centre for Cosmoparticle Physics, Stockholm, Sweden), Ll. Mas-Ribas (Institute of Theoretical Astrophysics, University of Oslo, Oslo, Norway), M. Dijkstra (Institute of Theoretical Astrophysics, University of Oslo, Oslo, Norway), C. C. Steidel (California Institute of Technology, Pasadena CA, USA ), S. C. Chapman (Department of Physics and Atmospheric Science, Dalhousie University, Halifax, Canada ), R. Feldmann (Department of Astronomy, University of California, Berkeley CA, USA ), A. Avison (UK ALMA Regional Centre Node; Jodrell Bank Centre for Astrophysics, School of Physics and Astronomy, The University of Manchester, Manchester, UK), O. Agertz (Department of Physics, University of Surrey, Guildford, UK), Y. Ao (National Astronomical Observatory of Japan, Mitaka, Tokyo, Japan), M. Birkinshaw (H.H. Wills Physics Laboratory, University of Bristol, Bristol, UK), M. N. Bremer (H.H. Wills Physics Laboratory, University of Bristol, Bristol, UK), D. L. Clements (Astrophysics Group, Imperial College London, Blackett Laboratory, London, UK), H. Dannerbauer (Instituto de Astrofísica de Canarias, La Laguna, Tenerife, Spain; Universidad de La Laguna, Astrofísica, La Laguna, Tenerife, Spain), D. Farrah (Department of Physics, Virginia Tech, Blacksburg VA, USA), C. M. Harrison (Centre for Extragalactic Astronomy, Department of Physics, Durham University, Durham, UK), M. Kubo (National Astronomical Observatory of Japan, Mitaka, Tokyo, Japan), M. J. Michałowski (Institute for Astronomy, University of Edinburgh, Royal Observatory, Edinburgh, UK), D. Scott (Department of Physics & Astronomy, University of British Columbia, Vancouver, Canada), M. Spaans (Kapteyn Astronomical Institute, University of Groningen, Groningen, Netherlands) , J. Simpson (Institute for Astronomy, University of Edinburgh, Royal Observatory, Edinburgh, UK), A. M. Swinbank (Centre for Extragalactic Astronomy, Department of Physics, Durham University, Durham, UK ), Y. Taniguchi (The Open University of Japan, Chiba, Japan), E. van Kampen (ESO, Garching, Germany), P. Van Der Werf (Leiden Observatory, Leiden University, Leiden, The Netherlands), A. Verma (Oxford Astrophysics, Department of Physics, University of Oxford, Oxford, UK) and T. Yamada (Astronomical Institute, Tohoku University, Miyagi, Japan).